A rare colour shot of one of the 400s in action. This is 487 passing Singleton Park on Sketty Road en route for Langland Bay on service 87. No former commercial vehicle manufacturer has a greater following amongst the transport enthusiast community than the Middlesex based AEC company. Even though it was eventually absorbed into the giant Leyland group -itself now history - AEC had a long heritage not only as "Builders of London’s Buses" but as the manufacturer of many thousands of vehicles worldwide, providing reliable daily transport for the citizens of Lisbon, Teheran and Sydney, amongst others. The AEC legacy lives on in the many hundreds of vehicles now in preservation and in the substantial number of 1960s built ‘Routemaster’ buses still to be seen on the streets of central London. South Wales once was part of the AEC empire. In particular, South Wales Transport often tried out new designs in service on its difficult operating territory in Swansea; the steep hills were found to be an excellent proving ground! SWT also was often amongst the forerunners when it came to purchasing large numbers of new designs having, it can be assumed, seen the prototypes operating successfully! 482 at rest at Brunswick Street garage, Swansea. 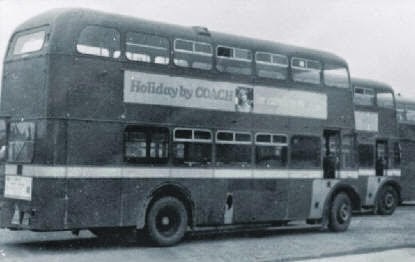 The buses first came into the SWT fleet in 1955 with deliveries continuing until 1957. The earliest examples were amongst the first production Regent Mk.Vs, carrying chassis numbers 003 upwards, underlining SWT’s willingness to purchase new designs. There were three basic varieties of ‘Four Hundreds’; normal height with Weymann bodywork, normal height with Willowbrook bodywork and the low height Weymann design. All had their entrances at the rear. The first deliveries were the normal height Weymann type (numbered 440 to 449, MCY 400-409), looking very smart in their deep red and cream livery. Indeed, the type was the last to carry the cream waistband which was a feature of the 1960s fleet. The earliest examples were allocated to Llanelli and some had platform doors at the rear - unusual in the SWT fleet and reportedly for use on the Llanelli to Swansea service 2. 447 waits at the bus shelter near Llanelli Rail Station. Incidentally, the blue post was a survivor from Llanelly (sic) trolleybus days. Sole survivor, 447 (MCY 407) on its old stamping ground at Llanelli. Fortunately number 447, complete with platform doors, has been preserved in original livery, appropriately in its old stamping ground at Llanelli. Coinciding with the delivery of the first batch were 450-459 (MCY 410-419). These had low height bodies with a sunken gangway and bench-type seating on the upper deck. Generally they were used on interurban services between for example, Swansea and the Swansea Valley. They were renumbered in the low height series as 1189-1198 in 1958. Further high bridge examples were delivered in 1956 (460-480, NCY 451-471) and 1957 (481-500, OCY 664 -683). These were all of the Weymann type except 491-500 which were of the rounder appearance Willowbrook design. followed closely by 494 with Willowbrook behind. By now the Four Hundreds formed a sizeable part of the SWT fleet and could be found on a variety of work. 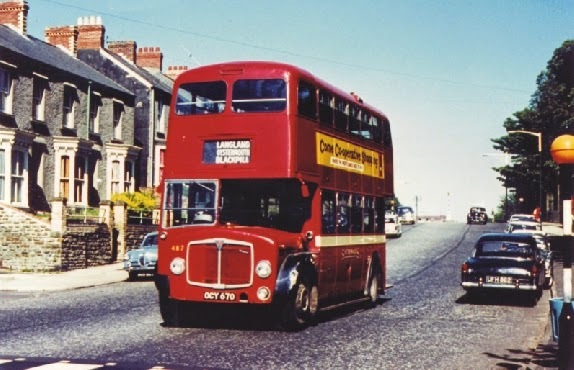 In Swansea they will be best remembered for shuttling back and fore between Alexandra Road and Sketty (later Sketty Park) on route 74 or crawling across Townhill on crowded summer services from Morriston to Caswell Bay. Only Two can Play' starring Peter Sellers, scenes for which were shot in Swansea. Stills of 476 (NCY 467) taken from the 1961 film, 'Only Two can Play' starring Peter Sellers. NCY 467 once again - by now a training vehicle at Brunswick Street depot. As is often the case, one of the batch (476, NCY 467 of 1956), became something of a celebrity when it appeared in the 1962 Peter Sellers film, ‘Only Two Can Play’. For some reason, the same bus also appeared in a company promotional film and in 1967 was chosen for continued service as a driver training vehicle. After all this the bus passed to Port Talbot Borough Council as a mobile workshop where it lasted until the mid seventies - it was later scrapped, but would have been an excellent preservation candidate!. 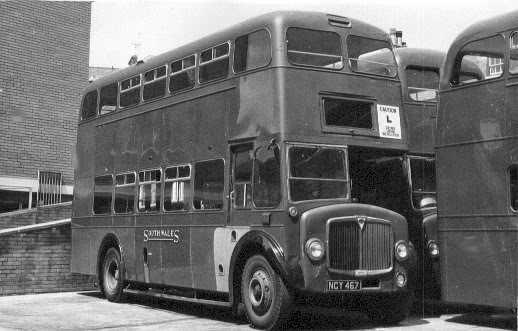 The Willowbrook bodied examples, having spent their early years in Swansea were later transferred en bloc to Llanelli. At around the same time they each lost their cream waistbands and saw out their days in overall red, 496 and 498 lasting until 1974 as driver training buses. The pair were last seen on the scrap line at Neath, eventually being towed to Yorkshire for breaking. 483 and a sister await their fate at Ravenhill Depot, Swansea, in 1967.
to Scutt of Owston Ferry. The Four Hundreds were taken out of service by between 1966 and 1968. The writer remembers seeing lines of these vehicles awaiting disposal at Ravenhill in 1967-68. In those days, buses were withdrawn as batches based on age, rather than because of the condition on particular vehicles. Many of them therefore had several years of life left in them and were soon snapped up by operators such as Smiths of Reading or Ledgard of Leeds and once again found themselves in front line service. Others passed to contractors and a variety of minor operators including one who used ran hop-pickers’ services in Kent. And so, a well-loved type passed into history with 447 now as the last known survivor of the SWT ‘Four Hundreds’. It is worth noting that when SWT had purchased early examples of AEC Regent Vs in 1955, it would clearly, eventually, become amongst the first to take them out of service. SWT was totally unique at that time in replacing one batch of Regent Vs with a more modern version of the same marque; these were to become known as the ‘Six Hundreds’ and remain a story for another day!